6 Quart Instant Pot for Almost Half Off! I mentioned this Instant Pot deal in the earlier Amazon Prime Day roundup, but Amazon kept crashing because so many people were trying to checkout. However, it looks like this is back in stock! 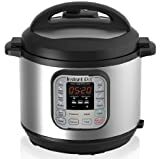 For the next 27 hours or until supplies last, the Instant Pot DUO 6 Qt is only $58.99 for Amazon Prime members, down from $99.95 normally. This is a 7-in-1 multi-use cooking machine with the following functions. Both my brother and sister have one of these and swear by them. I can't to try mine out this weekend!